I found this picture and totally forgot to post about Oak Flats. Mike and I drove up to Albuquerque at the beginning of May to race Oak Flats. I was a little nervous because I rode it on beginner last year, which means it was only one short lap. This year in sport you have to ride two laps. We loved this race! It was a good thing it was two laps because I did terrible on the first lap because I got stuck behind a really slow guy, but fortunately I passed him at the end of the first lap and was able to get in second place. 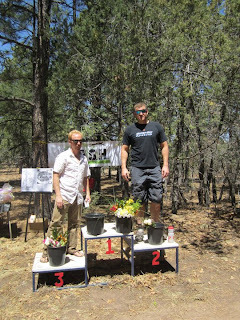 Mike had a bad case of optic neuritis during this race which means he was blind in one eye...and he got on the podium! CONGRATULATIONS MIKE!